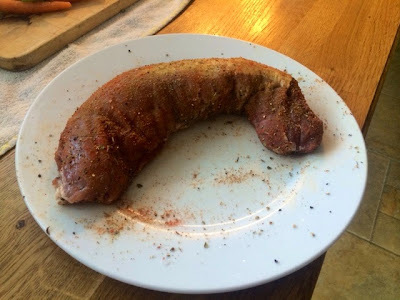 Pork has always been my least favourite meat. 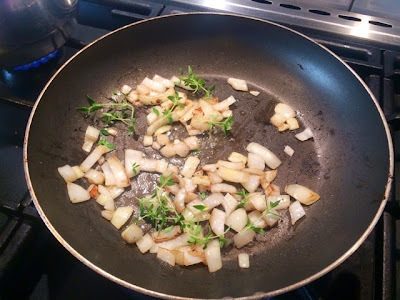 For years I always associated it with those horrible dry chops with a huge lump of fat attached that you always seemed to get back when I was growing up. 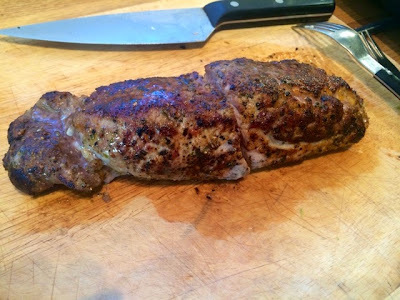 I had decided that pork was just something I didn’t like, until I tried pork loin and had a totally different experience. Nice and juicy with no huge strips of fat, for me it was a totally different experience and I began to try pork again (although I’m still not sold on chops). 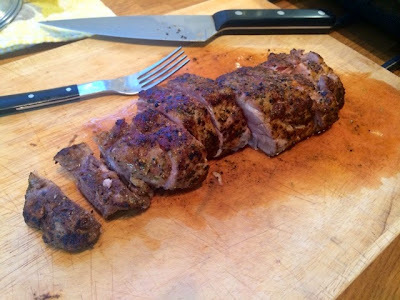 A pork loin is a really nice lean piece of meat that is so easy to prepare and cook and you get loads of flavour out of it. 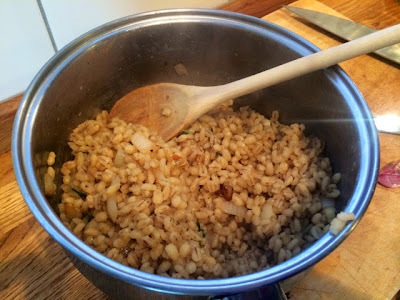 I decided to serve it with pearl barley as it’s an ingredient I’ve loved since I first tried it out for my sun dried tomato pearl barley risotto. It’s cheaper and lower in calories than rice and and a great source of fibre. I also find it much tastier and more filling so you don’t eat as much. A really great diet alternative. 1. 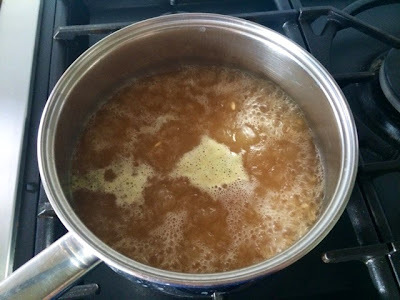 In a pan heat the chicken stock and add the pearl barley. 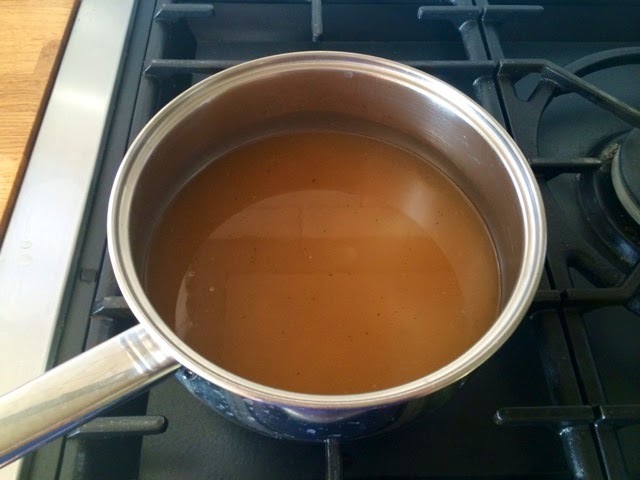 Bring to the boil and simmer for 45 mins until cooked. Keep and eye on it to prevent from drying out. 2. Preheat oven to 200˚C. 3. 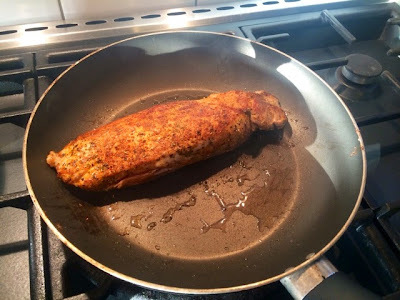 Cover the pork loin with the cumin, paprika, salt and ground mixed peppercorns, ensuring an even coating and rubbing in with a little olive oil. 4. 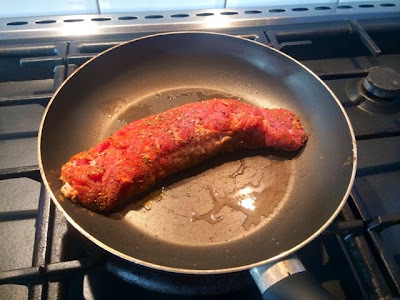 Heat a little oil in a frying pan on a high heat and cook the outside of the pork loin to seal it. 5. Place in a baking tray and roast in the oven for 20 minutes. 6. 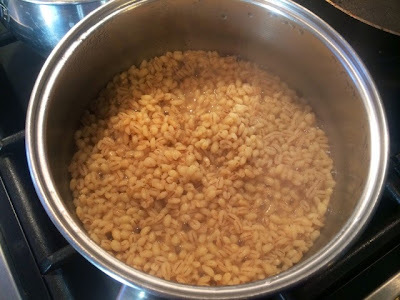 When the pearl barley is cooked drain off any excess liquid. 7. 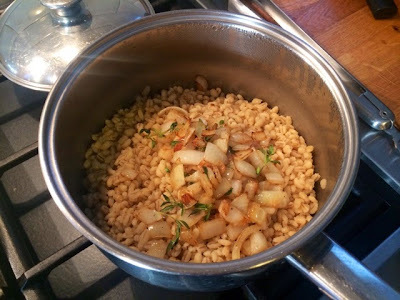 Use the frying pan to fry the onions, garlic and fresh thyme until the onions are softened then mix with the pearl barley. 8. 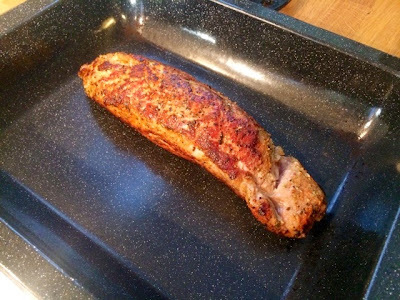 Remove the pork loin from the oven and slice down the middle to check it is cooked through. If not return to the oven for a further 5 to 10 mins. 9. 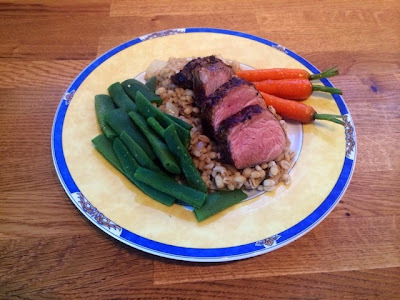 Slice into 1 inch chunks and serve on a bed of the pearl barley with vegetables. 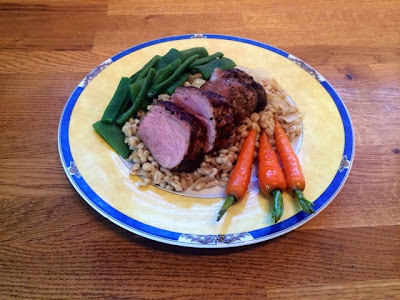 Served here with runner beans and my Orange Sautéed Baby Carrots.